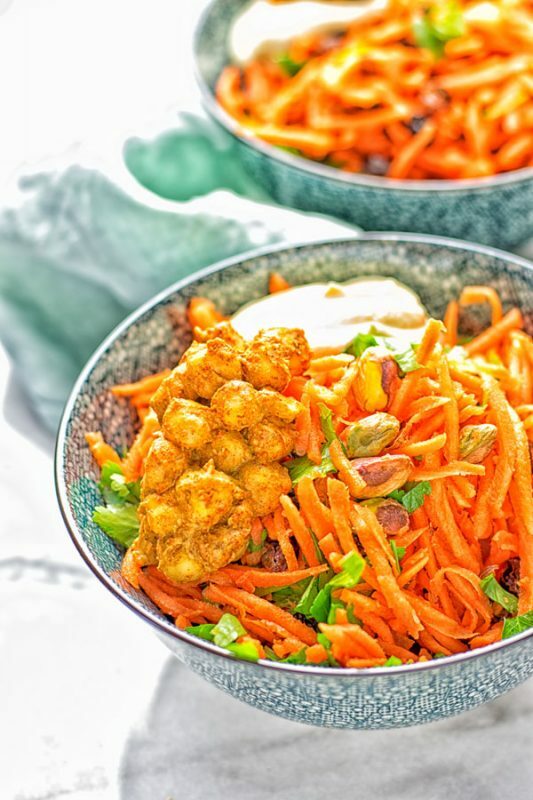 This vibrant Moroccan Carrot Salad is packed with fantastic flavors, entirely vegan and gluten free. 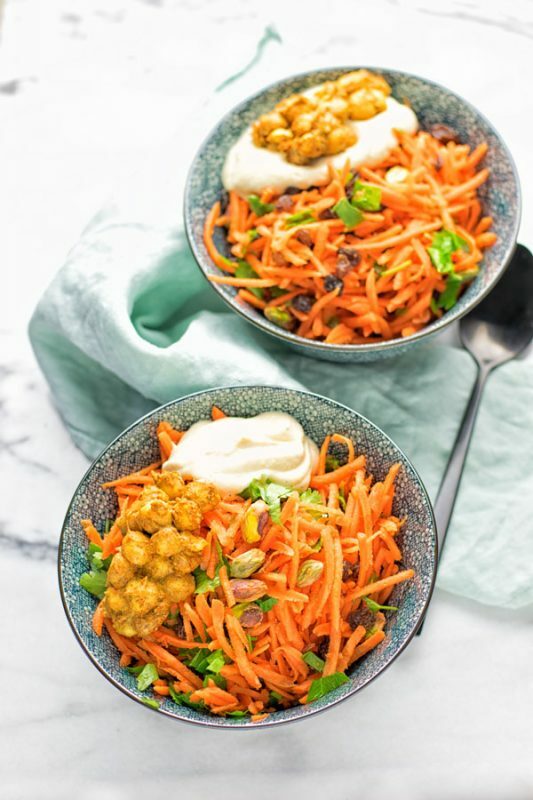 With fresh, shredded carrots, spicy chickpeas, and creamy hummus this easy salad is seriously a must make for everyone. I do not lie when I’m telling you I’m all about exciting flavors from all over the world. Just think about my Moroccan Chickpea Lentil Soup (Harira). Yes, I have a thing for spices. Honestly, who wants bland food? Nobody. Life is too short for bland and tasteless food. I hope you are all ready and excited for this flavor sensation. 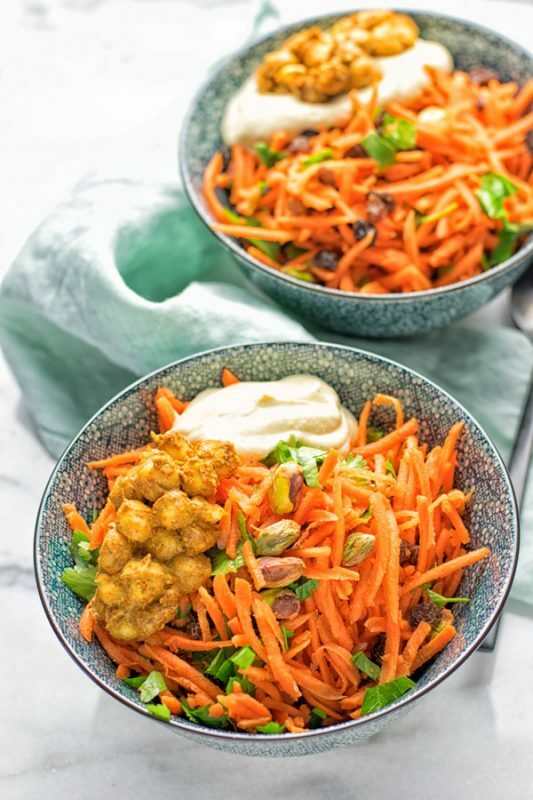 You can be sure this Moroccan Carrot Salad is full of incredibly flavors, tasty, easy, satisfying, filling, addictive, just the right mount of flavors in and out, fresh, mouthwatering, and so worthy to go into an everyday routine. Before we’re going into this tasty kitchen adventure together, let’s talk about hummus. You can choose your favorite hummus from the store or you can make hummus from scratch. Which in my opinion is the more delicious deal. Trust me, if you ever try to make your own easy hummus, you won’t turn back to store bought. It tastes so much better and fresher. Plus it’s super easy to make. You only need 30 seconds and you are ready to enjoy. All you need to do for this 30 Seconds Best Hummus Recipe is to put all the ingredients like tahini, chickpeas including the brine, water, cumin, garlic and lemon juice in the bowl of a blender. Season with salt and pepper and blend until really smooth and creamy for 30 seconds. Could be any easier? I don’t think so. 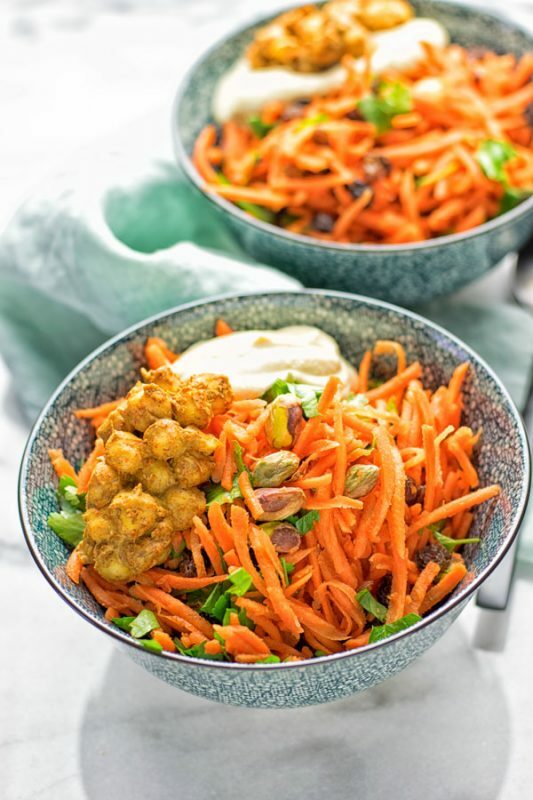 For this Moroccan Carrot Salad we’re going to make roasted chickpeas which will add a lovely crunch and so much flavor. Let me show you how to make roasted chickpeas. In a bowl, combine drained chickpeas, Ras El Hanout spice blend. Take 1/3 cup from your prepared hummus and mix with everything. On a baking sheet prepared with parchment paper, bake the chickpeas for around 15 minutes at 410°F. Everything is ready for assembling the salad: mix shredded carrots, raisins, pistachios, roasted chickpeas in a bowl. Top with the remaining hummus. Divide into plates or devour straight from the bowl. One word to the Ras el Hanout spice blend. You can for sure buy a ready made mix. For real it’s so easy you have everything in one package no need to mix. But I don’t recommend that because my blend is specific for this salad and I find the flavors go so amazingly well together. It’s not that much work to mix the spices together. Store bought versions often miss cumin and paprika. So if you go with this version, just add 1 tsp paprika and 2 tsp cumin in your mix. You definitely won’t need the whole mix, please adjust the amount to your own liking. I would say 2 to 3 Tbs are enough, but if you need something more adjust. The same for my homemade version I find it’s just the right blend, but If you do missing something play around and adjust. Can you believe me when I tell that something which taste so good is so healthy at the same time? For real it’s true. Only recently I found out that pistachios are not only a tasty snack to munch on. They are also an immune booster, a good source of fiber, protein, phosphorus, and vitamin B6. 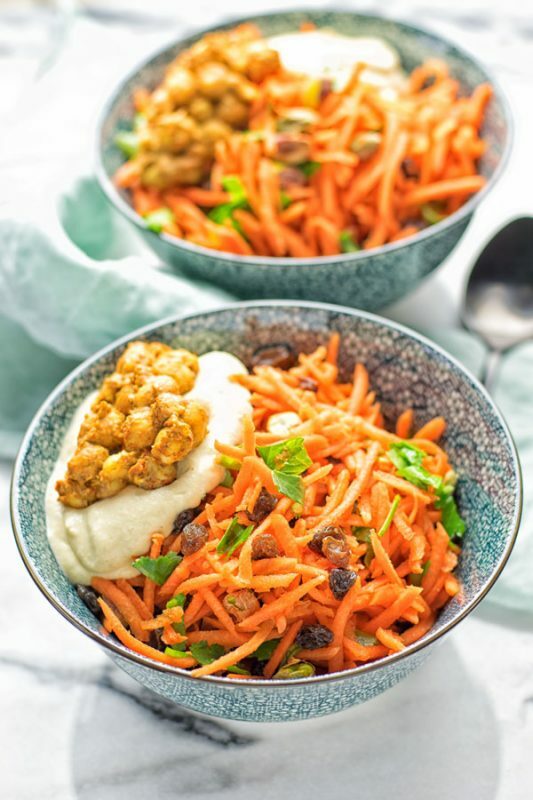 So with this Moroccan Carrot Salad you get many antioxidant benefits, a great plant based protein source, vitamins and minerals. Plus it’s super easy to make – a winner. The whole package makes a great lunch, dinner, or even snack something in between. Also great to bring on work and skip the fast food counter like these 10 Best Easy Vegan Work Lunch Recipes. 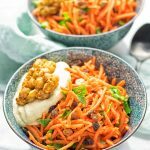 If you give the Moroccan Carrot Salad a try tag me on Instagram and Facebook, show me your remakes with a picture. See you around, Florian. In a bowl, combine drained chickpeas, Ras El Hanout spice blend. Take 1/3 cup from your prepared hummus and mix with everything. On a baking sheet prepared with parchment paper, bake the chickpeas for around 15 minutes at 410°F. Assembling the salad: mix shredded carrots, raisins, pistachios, roasted chickpeas in a bowl. Top with the remaining hummus. Divide into plates or devour straight from the bowl.